Let’s talk a little bit about medical education, we’ll head back over to the white board. I told you about the paradigm, and I told you about how we’re taught that cycles run a certain way. And basically when you eat these foods, these are the killer carbs: wheat, breads and bagels, pasta, anything made of flour, cakes and muffins, sugars (sugars include high fructose corn syrup, maple syrup, agave nectar, any kind of sugars), corn, potato, rice/cereals, and other starchy foods. When you eat any of these things, what happens is it goes into your body and your body converts these carbohydrates into glucose. Glucose is sugar – that’s blood sugar, circulating in your blood. What we’re taught in school is that glucose is metabolized by the body, goes down, and produces two things. One is ATP – this is what your body uses to power itself. And the other thing it can produce is fat. So it stores the glucose as fat, or the body burns the glucose as energy. This is taught as normal human metabolism. However, there is also a way – and this is the reverse – that the fat could be turned into glucose or into ATP. You can see, as soon as we draw this, it’s a paradigm. 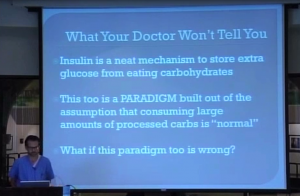 It’s a paradigm, it’s a model, it’s a template that says burning glucose is normal. It says eating these refined carbohydrates, turning all that into glucose and turning it into energy and fat is normal. Because if it was not normal, this thing would be upside down. And that’s what I’m trying to say here is that it’s not normal. And this is the way that it should be taught. The reason it’s taught with sugar on top is because the people who discovered sugar and discovered these metabolic pathways were essentially Western physicians, Western scientists who started from the preconception that eating lots and lots of wheat and eating lots and lots of sugar and potatoes is normal. But it’s not. We’ll talk about why it’s not normal. 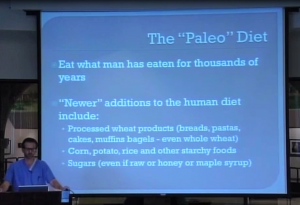 You may have heard of this thing, it’s called the “Paleo” diet. The Paleo diet is just the latest iteration of low carbohydrate diets that have been popular and have been known to work for two hundred years. Even if you say, “Well, the invention of agriculture was ten thousand years ago so we’ve been eating wheat for ten thousand years.” Well, ten thousand years out of two hundred thousand years is like only 4% of humanity. Which means that your body doesn’t recognize these refined carbohydrates and doesn’t know what to do with them. And that’s what the Paleo diet is all about. 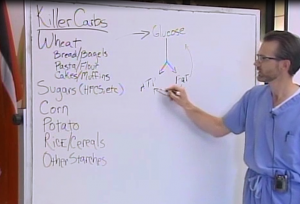 These are the high carb foods we just went through on the white board. These are the new additions to your diet. These are the foods that your body doesn’t know how to process. Insulin – this is another thing that we’re taught in medical school. Some of you might know about insulin because you’re diabetic, or you may know of people who are diabetic, they take insulin. Basically in medical school we’re taught that you eat these killer carbs, and that makes glucose. Glucose gets into your bloodstream. If the glucose gets too high, you go into a coma. That’s what happens to diabetics who eat high-carb meals but they don’t know they’re diabetics yet, and they end up in the medical intensive care unit – maybe this has happened to some of your family members. If the sugar gets too high, then they end up very sick and they end up in a coma. So your body, to protect yourself from that happening, makes a hormone called insulin. What that hormone does, that hormone says, “Man, we gotta clear all the glucose out of the body. 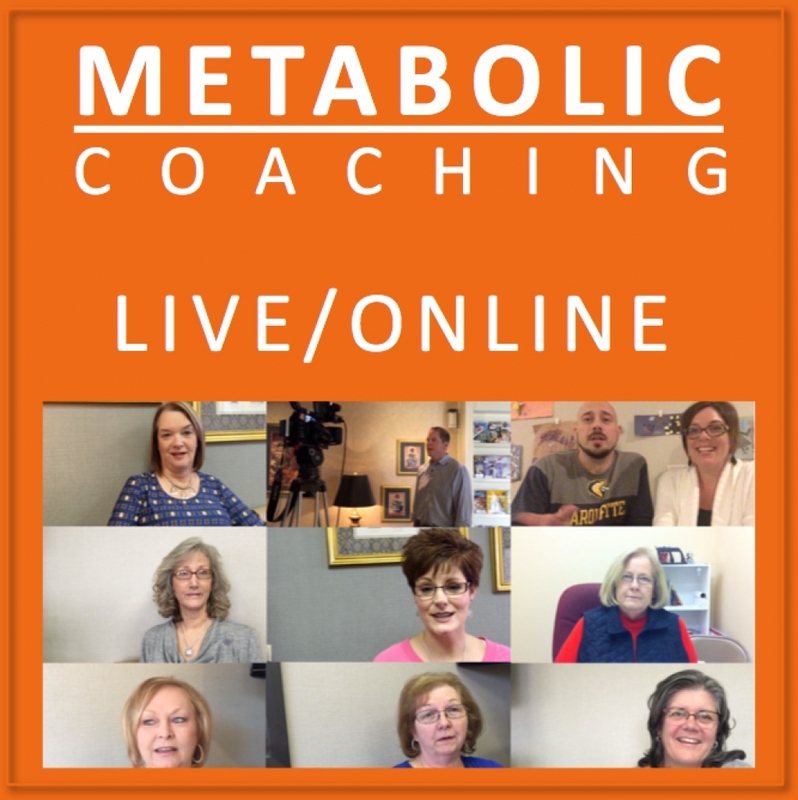 We gotta store fat.” And so the glucose that’s coming down to power your body gets stopped by the insulin. And the insulin essentially puts the glucose, which is the sugar, puts it into your fat cells and helps the liver to make more fat to circulate into your body that goes into your fat cells, and it also tells your muscles to burn insulin. It tells your fat cells that there’s fat inside of here, there’s fat that wants to get out of all your fat cells. The insulin tells your fat cells, “Don’t let any of that fat out. 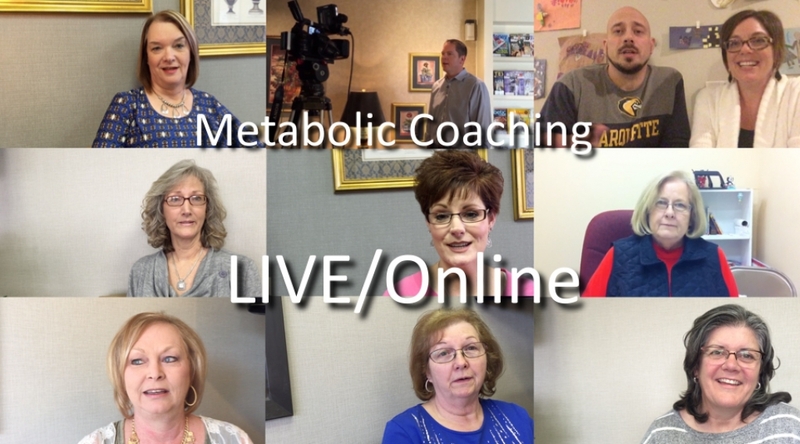 We gotta keep all the fat inside.” So it says, “Store fat, store fat, store fat, store fat.” And this insulin, this is the number one hormone that says to store fat. How does the insulin get elevated? Insulin gets elevated by eating these carbohydrates. These carbohydrates cause the blood sugar to go high which causes the insulin and it’s the insulin itself that causes you to store fat.